The Comparison Noise Emitter VI (CNE VI) is the latest generation broadband noise source, capable of providing a continuous output from 30 Hz to 6 GHz. 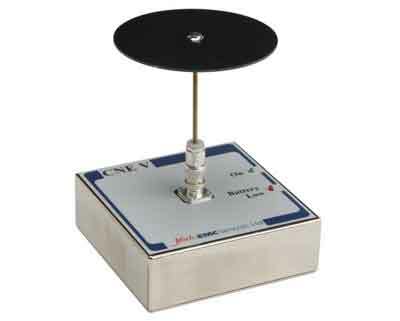 The stable output allows the CNE VI to be used as a general-purpose reference source for characterising and verifying both conducted and radiated test environments. The CNE VI is a broadband noise source that is capable of producing a continuous noise output within the 30 Hz to 6 GHz frequency range. The broadband nature of the output enables the observation of details within the spectrum that would be missed using a comb generator. The CNE VI features two separate outputs; a 50 Ω BNC connector for the 30 Hz to 30 MHz signal and a 50 Ω N-type output connector for the 30 MHz to 6 GHz signal. For radiated operation, either output can be attached to a selection of antennas available in a range of frequency coverage and types. An IEC 320 adapter is also available to provide a connection to LISN equipment, as well as an RJ11/RJ14/RJ25/RJ45 adapter for connection to telecoms ISNs. The CNE VI is an ideal source for carrying out checks on Open Area Test Sites (OATS) and fully- or semi-anechoic chambers. The CNE VI is compact and battery powered, allowing operation as an electrically small source, which minimises the effect of the CNE VI itself when characterising the electromagnetic environment. The CNE VI is housed in a metal enclosure so that it can be mounted in direct contact with a metal ground plane as may be required by some tests. The CNE V is a broadband noise source which provides continuous output power from 9kHz to 1GHz. The broadband nature of the output enables the observation of details within the spectrum which would be missed with a comb generator. For radiated operation two monopole antennas, optimized for different bands of the spectrum, are available which attach to the top of the unit. The CNE V is an ideal source for carrying out checks on open area test sites (OATS) and anechoic chambers. The CNE V is battery powered to allow operation as an electrically small source which minimizes the effect of the structure of the CNE V itself when characterizing the electromagnetic environment. The CNE V is housed in a metal box so that it can be mounted in direct contact with a metal ground plane as may be required by some tests. The power output level of the unit avoids the overloads possible with impulsive noise sources which may cause damage to the sensitive input circuits of receiving equipment. In the same way that using the CNE V with an antenna can be used to check radiated measurement systems, a BNC connector provides a direct 50Ω matched output which can be used to carry out checks on conducted measurement systems. An adaptor is available (LSA02) which provides a capacitive link from the output of the CNE to a standard IEC 320 mains power connector. This allows checks and investigations on conducted measurement systems to be made, for example using a LISN or an absorbing clamp. Radiated and conducted measurement systems validation and verification. The Comparison Noise Emitter V+ (CNE V+) is an enhanced version of the low-cost CNE V broadband noise source, providing an extended continuous output from 9 kHz to 3.5 GHz with a useable output to 5 GHz. The highly stable output allows the CNE V+ to be used as a general-purpose reference source for characterising and verifying both conducted and radiated test environments. The broadband nature of the output enables the observation of details within the spectrum that would be missed when using a comb generator, whilst the power output level of the unit avoids the overloads possible with impulsive noise sources that may cause damage to the sensitive input circuits of receiving equipment. The CNE V+ is supplied with a 50 Ω BNC-type output connector for direct connection to conducted measurement systems. An IEC 320 adapter is also available to provide a connection to LISN equipment, as well as an RJ11/RJ14/RJ25/RJ45 adapter for connection to telecoms ISNs. 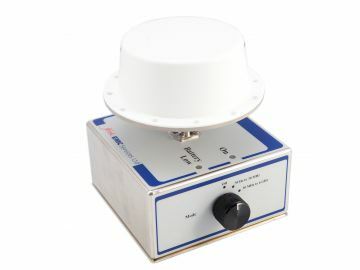 The CNE V+ can also be connected to an antenna, to generate reference fields for use with radiated emissions test environments such as Open Area Test Sites and anechoic chambers. A selection of antennas that connect directly to the CNE V+ for this purpose is available. The CNE V+ is compact and battery powered to allow operation as an electrically small source at lower frequencies, thereby minimising the effect of the CNE V+ structure when used as a radiating reference.